I had to draw “bike girl”. That’s how I call her. She was part of a group of spring breakers. I’m also trying to work on my style. What do you think? I feel like I should mention the beach at least once. Although I was too busy just lying there, doing absolutely nothing and loving it. There were two big palm trees on the public beach that provided a good amount of shade. So a lot of people gathered under them. It was also the time of spring break when I arrived there, towards the end of March. I had no idea. Luckily this public beach was relatively empty as it is rather “far off” from the resort area. 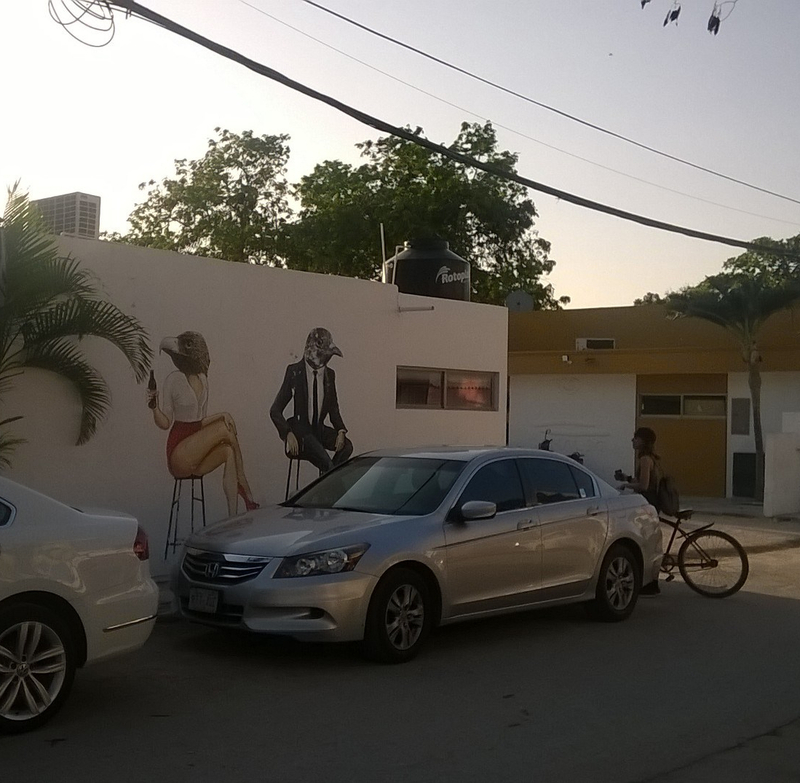 This is the last one from my bike tour around Tulum. These guys are selling tepache de piña, a fermented pineapple drink. Unfortunately I did not get to try it yet. 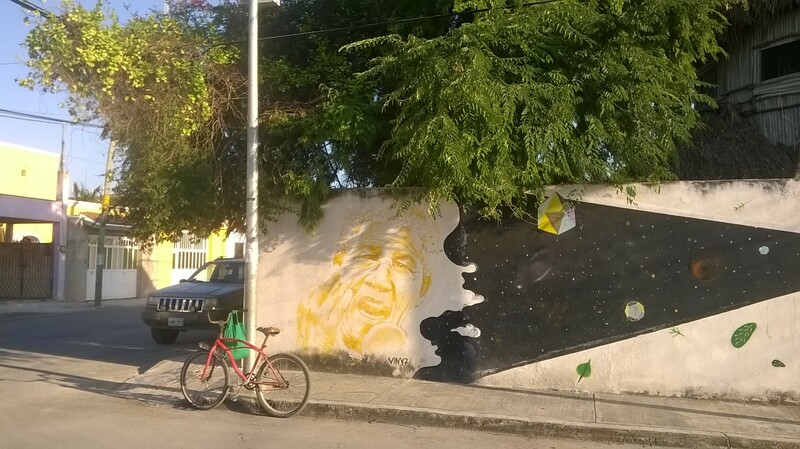 Otherwise you can find a lot of really cool street art around Tulum. And then there was this place who probably got rid of the guy who did the spelling… No, the name of the place is not Restaun. I checked. Mexican lady in flowery Mayan dress, cycling down the street on this tricycle thing. Another beetle in the background. What can I say, I took a lot of photos of dogs. This one just stood there for a while not sure what to do next. Then he started to wander off. This building definitely left its impression on me as it was so blinding bright… It was hard not to notice it, especially in the bright afternoon sun. It seems to be an apartment hotel. Would you like to stay there? Plenty of colourful houses around here. What colour is your house or you would like it to be? Observation: The brighter the better. 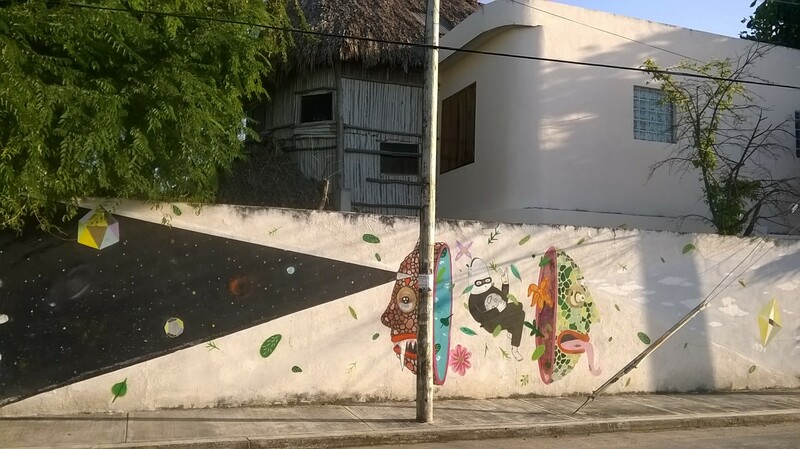 Based on a really bad snapshot I took during my bike tour through the town of Tulum. I did like their slogan… Mas por menos. Another truck. I enjoyed watching them while they were throwing boxes and bottles up and down. Observation: There is so much green around here. These big delivery trucks where pretty much everywhere. The first draft looked like this. I really start to have fun with the water paintbrush that I bought. I think it gives you a completely different watercolour experience than with a normal paintbrush. Also it is less messy. Encountered these two on my bike tour around town. It seemed to me that it was the big brother who had to pick up the little one, but big brother was not too excited about walking down the street with little brother. What struck me most, the first time I visited Mexico, was the diversity of culture, landscapes, nature, people and especially the extreme poverty and wealth, and everything in between, that can be seen at every corner. On the first windy and cloudy day since arrival, I seized the opportunity and went for a cycle around the town of Tulum. I don´t want this to become a travel blog but rather put down some random impressions that I got along the way. Like this girl who ran after her pug to catch him, after he had escaped from the house. When you look up Tulum, you get all those beautiful beach photos, the ruins and the expensive beach resorts that will cost you 200$ plus per night. What most people wont see are the slums in the middle of the forest, where people most likely live of 200$ per month, situated right between those fancy resorts and the town centre. 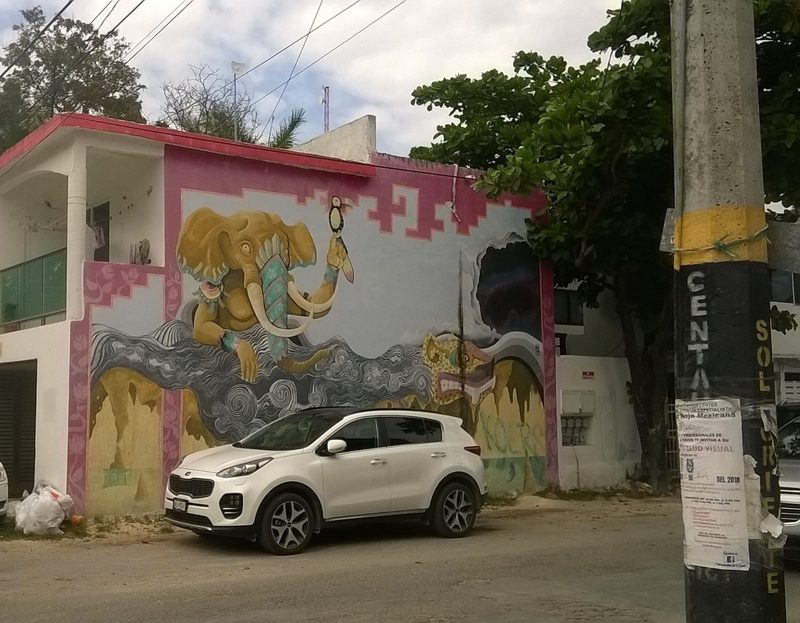 I usually don´t take a lot of photos, but Tulum had a lot of beautiful street art, even in the poorer parts, that I tried to capture because of the colours. So I have been in Mexico for roughly 2 weeks now and I am loving it. I have been here last in 2014 for ca 3 months travelling around the southern parts of the country. I also spent a good amount of time on the beach back then because I had never been to a Caribbean like beach before and it was simply incredible. So I wanted to start my trip by getting my much needed vitamin D on the beach in Tulum, Quintana Roo, after spending yet another winter in Iceland. I went back to the same hostel my boyfriend and I stayed in 3 years ago because it is a 5 minute bike ride from the beach and it has this beautiful hangout area with a small pool, hammocks and lots of plants. So here it was that I made my first attempt of sketching with the watercolours and pens I brought with me. I have to admit it partially felt like a struggle as it took me some time, but in pleasant 25 degrees with my morning coffee next to me it was also quite enjoyable.